The Knitting Pirate » In Which the Pirate Works on Lace. « In Which the Pirate Has a Niece! In Which the Pirate Works on Lace. Between the excitement of the niece and the holiday weekend, I didn't get to do much knitting. But here is my (slow, slow) progress on the ostrich plumes scarf! It doesn't look like much yet, does it? I do have pins, but they're not very accessible at the moment. 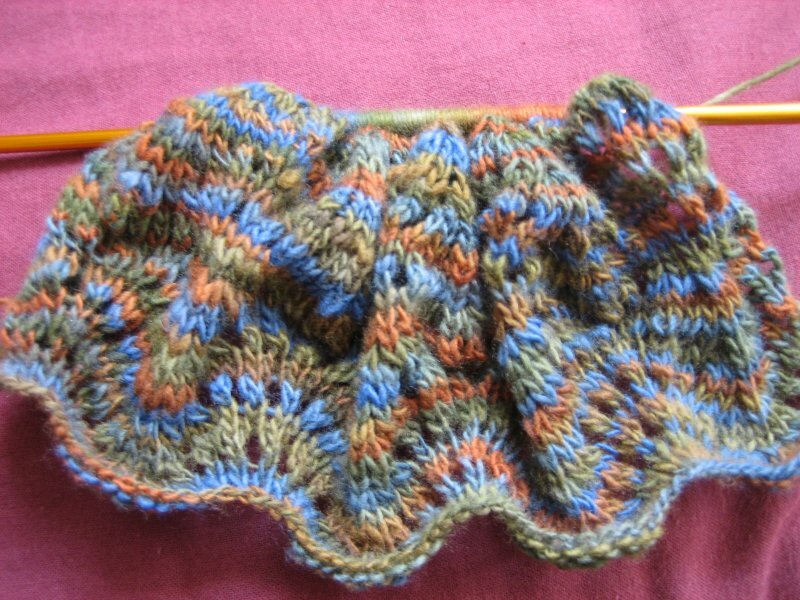 I can kind of get an idea of what it will look like when I stretch it out by hand, though of course it will have to be blocked for real after all the knitting is done. 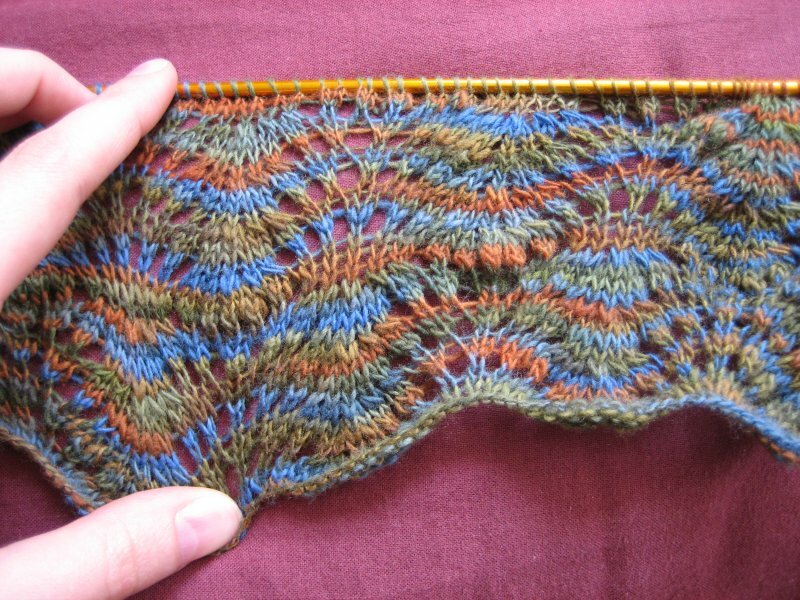 I'm considering a set of blocking wires; pinning seems like a real pain! Now, what I don't know is, how long should I make this thing? Originally, I was thinking that it would be something I'd wear with dressy work clothes, but the way the variegation is playing out, it doesn't look too dressy. So now I'm considering how to wear a lacy scarf with less dressy clothes. I never thought of myself as a person to wear accessories. It's a strange day when I wear more jewelry than my wedding ring and the stud earrings that I always forget to take out. Anyway, should it be a long scarf? A short one that I wear with a pin at my neck? A medium one that I can wrap around and let flow? If it helps any, it looks like it will be at least 14" wide after it's blocked. In other, very cool news, I'm going to be in Ottawa on Worldwide Knit In Public Day. My plan is to take the sock and the Ninja to the Highlander, so that we can drink scotch while we knit in public! The sock is on hiatus until I actually start traveling, and is glaring at me from the corner of the desk. It looks so small and lonely. Maybe I'll give it a few rounds so it doesn't feel left out. This entry was posted on Thursday, May 31st, 2007 at 12:48 and is filed under lace, ostrich plumes, scarf. You can follow any responses to this entry through the RSS 2.0 feed. Both comments and pings are currently closed.